Part of the Carnival series. 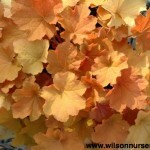 Peach foliage with deep orange veining with silver overlay. 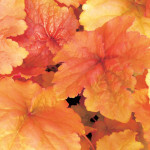 Attractive slightly ruffled leaves, has a naturally compact and tidy mounding habit. Tolerates heat and humidity. Fiery, red hot foliage in early spring and fall. Spikes of pink, bell-shaped flowers shimmy above reddish stems in summer. A superb companion with seasonal garden color. 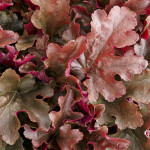 Provides bold texture and color contrast in mixed containers or borders in bright or dappled shade. Evergreen in mild winter climates. Compact, mounding habit. 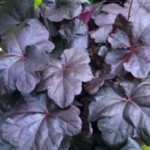 Glossy dark maroon, almost black, rounded leaves keep their color all season. Contrasting spikes of white flowers appear in June and July. Excellent when massed or as a specimen plant in a perennial border. Very cold hardy. Good resistance to powdery mildew. Also known as Small-Flowered Alumroot. Ivy-leafed. 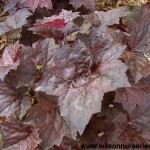 Deep mahogany red foliage which fades to bronze-green in heat. Clump forming habit makes these effective for use as a groundcover, in rock gardens or as edging plants. Bell-shaped pinkish-white flowers in late spring. Will tolerate full sun if moisture is available. 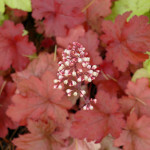 ‘Palace Purple’ is perhaps the most well-recognized and widely planted variety of all heucheras. 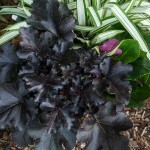 A stunning black foliage plant for both shade and sun! 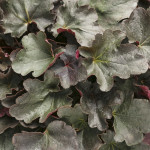 Forms an incredibly dense habit of shiny, jet black leaves with scalloped, ruffled edges and rosy purple undersides. 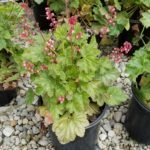 Topped with white flowers with pink calyxes.Thrives in part shade but will grow in sun or shade. 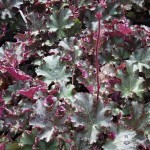 Dense, ruffled glossy purple foliage with cream, bell-shaped flowers that rise to 18″ mid-summer on bright red stems. 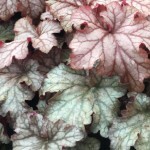 It’s neat and tidy habit sets it apart from the many new leafy purple-leaf Heuchera introductions. A vigorous, clump-forming cultivar with unique apricot colored foliage. The lobed, rounded leaves emerge gray-red in spring and mature to an apricot-caramel color by summer. Soft but showy color adds warmth and contrast to mixed containers and woodland plants. Thrives in summer heat and humidity. Produces airy Light pink flowers in early summer on slender stems. 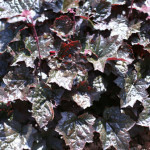 Giant 8″, peach-orange colored leaves with silvery-white overlay emerge in the spring, darkening to rose-purple in the fall. Tiny, creamy white, bell shaped flowers in late spring. Heat and humidity tolerant. A myriad of light pink flowers which age to a deeper rose red are produced in tight wands on 18-20” scapes. When flowers are spent—they dry in place on the stems instead of falling off giving this plant everlasting flowers. You’ll get a two toned look of light and dark pink flowers on the same plant for a strong show of color. Reblooms continuously, not in waves, from early summer to frost! Lightly silvered, mint green foliage that forms a compact, dense clump. Great tolerance of high heat and humidity. Cream, bell-shaped flowers rise above very dark, almost black glossy maple-shaped leaves in June -July. Tight, compact mound, Darker leaf that H. ‘Obsidian’. Works well as edging in perennial border, or in containers. 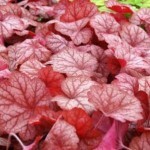 This distinctive coral bells forms a tidy mound of glossy, incredibly ruffled leaves. It emerges fiery orange-red in spring, then turns a unique blend of coppery orange, red, and purple tones. This selection is grown for its ornamental foliage, not its insignificant flowers. Try it in containers or near the front of the border. Brown sugar highlights transform the foliage with cold temperatures. Mounded habit with lobed, rounded leaves. Reddish pink flowers. Drought tolerant. Good resistance to powdery mildew.